Available now from TTI Europe is Amphenol’s broad range of RJ45 modular jack solutions which meet the growing demand for faster speeds and greater bandwidth for VoIP, Ethernet, WLAN, medical, and industrial applications. 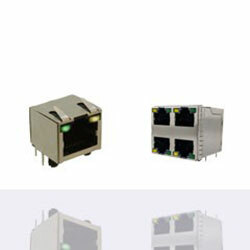 The connectors are available in vertical, right angle, are PoE and PoE+ compatible. High-performance RJ45 connectors meet Cat5e, Cat6, and Cat6A specification performance levels without external assistance and provide for easy upgrade from Cat5e to Cat6 or Cat6A. The connectors come with various shielding options and LEDs with a wide operating temperature of -55C to +85C. The devices are good for 750 mating and unmating cycles and are IR reflow compatible.